Dimensions 620'6" by 88'6" by 30'9"
The Revenges were completed during the First World War as slightly smaller, cheaper versions of the Queen Elizabeth class that sacrificed some speed, stability, and underwater protection for steadiness and armor protection. Unfortunately, this meant that funds for modernization always seemed to go to the Queen Elizabeths and the Revenges underwent very little modernization between the wars. 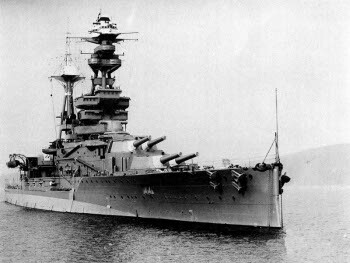 Aware of their obsolescence, Churchill considered them expendable and even proposed their use at one point as blockships. However, they were all that could be spared for the Far East after the destruction of Force Z. Curiously, this perception that the Revenges were expendable may have increased their usefulness, as they were used aggressively in the Mediterranean early in the European war.